More attention is being paid to reducing the number of people incarcerated in public and private prisons. But this is only part of the solution: jobs are needed…and not just any jobs…the formerly incarcerated need good jobs. 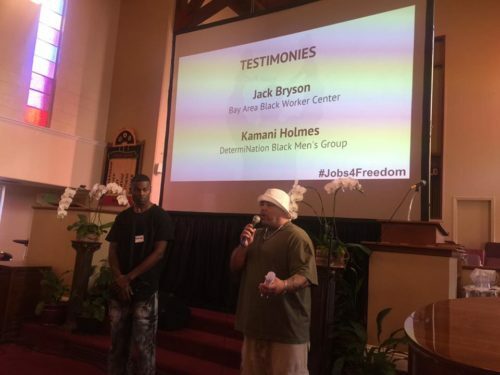 The Bay Area Black Worker Center with over 30 partners in the Justice Reinvestment Coalition of Alameda County launched the #Jobs4Freedom Initiative to get the Alameda County Board of Supervisors to approve a program to hire 1400 formerly incarcerated individuals in county jobs. The idea for the campaign from outreach revealing that approximately 80% of Black people who were contacted were either formerly incarcerated or had a family who had been incarcerated. This criminal record was believed to be a major reason why finding and holding quality jobs was difficult. The campaign is based upon the recognition that the County, which has played a role in the rise in mass incarceration, has an obligation to employ individuals now that the number of people in county jails has fallen in recent years. The Board of Supervisors approved the initiative — that would provide quality employment and court advocacy for participants. The next phase of the campaign is to ensure the full implementation of the initiative.